Does sleeping on the left side improve digestion? This article claims that it does, is there any truth to it? Sleeping on the right side is likely to worsen digestion problems, whereas sleeping on the left side may improve digestive symptoms. 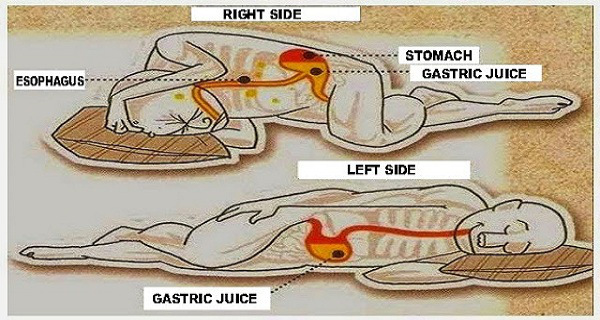 Sleeping positions on the right or left might have an influence on digestion if the digestive problems are related to gastroesophageal reflux per research mentioned below. Per Katz LC et.al. 's research in 1994 into whether there is a difference in the amount of gastroesophageal reflux when lying with the right versus the left side down, 'the direct comparison of the two positions demonstrated that the total amount of reflux time was significantly greater with subjects in the right decubitus position than in the left'. Per Khoury RM et.al. 's research in 1999 into influence of spontaneous sleep positions on nighttime recumbent reflux in patients with gastroesophageal reflux disease, the conclusions were 'the left lateral decubitus position is preferred in patients with nocturnal GER'. Several studies have shown that gastroesophageal reflux is increased in patients in the right lateral decubitus position along with the risk factors of exposure to tobacco, alcohol, chocolate, and high-fat meals influencing reflux. The reason for this phenomenon is not completely clear, but it may be related to increased transient LES relaxations in the right position, or possibly that the gastroesophageal junction lies above the level of gastric acid in the left lateral position. Specifically, total reflux time, average acid clearance, and LES relaxations are significantly prolonged in patients lying on their right side compared with the left lateral decubitus position. Not the answer you're looking for? Browse other questions tagged medical-science physiology sleep . Can GAPS diet cure autism, schizophrenia and dyslexia? Does drinking while eating impair digestion? Amongst the 60% of the population that have different size feet, is the left foot 80% of the time the larger foot? Does soaking in natural hot springs have any health benefits when compared to soaking in heated non-spring water?